FDA Grants Approval of IDHIFA®, the First Oral Targeted Therapy for Adult Patients with Relapsed/Refractory Acute Myeloid Leukemia and an IDH2 Mutation | Agios Pharmaceuticals, Inc.
"The FDA approval of IDHIFA provides the first-ever treatment option for patients living with relapsed or refractory AML and an IDH2 mutation. We appreciate the FDA's efforts to expedite the availability of IDHIFA for patients with this devastating disease weeks ahead of the PDUFA date," said Mark Alles, Chief Executive Officer of Celgene. "This milestone further illustrates the value of Celgene's unique distributed research model. Our partnership with Agios is an exceptional example of how Celgene and its collaborators can positively impact the lives of patients with high unmet needs." "The FDA approval of IDHIFA just four years after entering the clinic is the first of what we expect to be multiple first-in-class precision medicines for patients with cancer and rare genetic diseases from our productive discovery engine," said David Schenkein, M.D., Chief Executive Officer of Agios. "We look forward to working closely with Celgene to co-commercialize IDHIFA and provide access for patients in the U.S. with this devastating disease." "AML is a complex, heterogeneous disease, which is particularly difficult to treat in the relapsed or refractory setting," said Martin Tallman, M.D., Hematologic Oncologist and Chief, Leukemia Service at Memorial Sloan Kettering Cancer Center. "IDH2 mutations inhibit the normal maturation of myeloid cells, so having a treatment that targets this mechanism is promising for patients and encouraging to us as physicians who have it as our goal to provide options for every patient." The FDA approval was based on the clinical data from an open-label, single-arm, multicenter, two-cohort clinical trial of adult patients with R/R AML and an IDH2 mutation (Study AG221-C-001, NCT01915498). IDHIFA was approved concurrently with the Abbott RealTime™ IDH2 companion diagnostic test, which is FDA-approved as an aid in identifying AML patients for treatment with IDHIFA. The efficacy of IDHIFA was evaluated in 199 adult patients with R/R AML and an IDH2 mutation. IDH2 mutations were identified or confirmed by the Abbott RealTime™ IDH2 test. IDHIFA was given orally at a starting dose of 100 mg daily until disease progression or unacceptable toxicity. Dose reductions were allowed to manage side effects. Patients had a median age of 68 years (range of 19 to 100) and received a median of two prior anticancer regimens (ranging from one to six). More than half (52%) were refractory to previous therapy. In this trial, IDHIFA demonstrated a combined complete response or complete response with partial hematologic improvement (CR/CRh) rate of 23% (n=46) (95% CI: 18%, 30%). Median duration of CR/CRh was 8.2 months (95% CI: range 4.3, 19.4). For patients who achieved a CR/CRh, the median time to first response was 1.9 months (range, 0.5 to 7.5 months) and the median time to best response of CR/CRh was 3.7 months (range, 0.6 to 11.2 months). Of patients achieving a CR/CRh, 85% (39 of 46 patients) did so within six months of initiating IDHIFA. Among the 157 patients who were dependent on red blood cell (RBC) and/or platelet transfusions at baseline, 53 (34%) became independent of RBC and platelet transfusions during any 56-day post-baseline period. Of the 42 patients who were independent of both RBC and platelet transfusions at baseline, 32 (76%) remained transfusion independent during any 56-day post-baseline period. The safety of IDHIFA was evaluated in 214 patients with R/R AML and an IDH2 mutation. The median duration of exposure to IDHIFA was 4.3 months (range 0.3 to 23.6). The 30-day and 60-day mortality rates observed with IDHIFA were 4.2% (9/214) and 11.7% (25/214), respectively. In the clinical trial, 14% of patients treated with IDHIFA experienced differentiation syndrome, which can be fatal if not treated. IDHIFA can cause fetal harm if administered to pregnant women. The most common adverse reactions (≥20%) of any grade were nausea, vomiting, diarrhea, elevated bilirubin and decreased appetite. Serious adverse reactions were reported in 77.1% of patients. The most frequent serious adverse reactions (≥2%) were leukocytosis, diarrhea, nausea, vomiting, decreased appetite, tumor lysis syndrome, and differentiation syndrome. IDHIFA (enasidenib) is indicated for the treatment of adult patients with relapsed or refractory acute myeloid leukemia with an isocitrate dehydrogenase-2 mutation as detected by an FDA-approved test. Patients treated with IDHIFA have experienced symptoms of differentiation syndrome, which can be fatal if not treated. Symptoms may include fever, dyspnea, acute respiratory distress, pulmonary infiltrates, pleural or pericardial effusions, rapid weight gain or peripheral edema, lymphadenopathy, bone pain, and hepatic, renal, or multi-organ dysfunction. If differentiation syndrome is suspected, initiate corticosteroid therapy and hemodynamic monitoring until symptom resolution. Differentiation Syndrome: See Boxed WARNING. In the clinical trial, 14% of patients treated with IDHIFA experienced differentiation syndrome. Differentiation syndrome has been observed with and without concomitant hyperleukocytosis, as early as 10 days and at up to 5 months after IDHIFA initiation. If differentiation syndrome is suspected, initiate systemic corticosteroids and hemodynamic monitoring until improvement. Taper corticosteroids only after resolution of symptoms. Differentiation syndrome symptoms may recur with premature discontinuation of corticosteroids. If severe pulmonary symptoms requiring intubation or ventilator support and/or renal dysfunction persist for more than 48 hours after initiation of corticosteroids, interrupt IDHIFA until signs and symptoms are no longer severe. Hospitalization for close observation and monitoring of patients with pulmonary and/or renal manifestation is recommended. Embryo-Fetal Toxicity: Based on animal embryo-fetal toxicity studies, IDHIFA can cause embryo-fetal harm when administered to a pregnant woman. Advise females of reproductive potential and males with female partners of reproductive potential to use effective contraception during treatment with IDHIFA and for at least 1 month after the last dose. Pregnant women, patients becoming pregnant while receiving IDHIFA, or male patients with pregnant female partners should be apprised of the potential risk to the fetus. Many drugs are excreted in human milk and because of the potential for adverse reactions in breastfed infants, advise women not to breastfeed during treatment with IDHIFA and for at least 1 month after the last dose. Celgene Corporation, headquartered in Summit, New Jersey, is an integrated global biopharmaceutical company engaged primarily in the discovery, development and commercialization of innovative therapies for the treatment of cancer and inflammatory diseases through next-generation solutions in protein homeostasis, immuno-oncology, epigenetics, immunology and neuro-inflammation. For more information, please visit www.celgene.com. Follow Celgene on social media: @Celgene, Pinterest, LinkedIn, Facebook and YouTube. At Celgene, we promise that patients have the opportunity to take advantage of significant advances in medicine that may help them live longer, better and healthier lives. Accordingly, we work to help ensure access to the clinical benefits of our innovative therapies. For patients receiving Celgene therapies, irrespective of their insurance situation, Celgene Patient Support® offers access information and support, which includes helping patients understand their insurance coverage and providing information about potential financial assistance options. Visit www.celgenepatientsupport.com for additional information. Agios is focused on discovering and developing novel investigational medicines to treat cancer and rare genetic diseases through scientific leadership in the field of cellular metabolism. In addition to an active research and discovery pipeline across both therapeutic areas, Agios has multiple first-in-class investigational medicines in clinical and/or preclinical development. All Agios programs focus on genetically identified patient populations, leveraging our knowledge of metabolism, biology and genomics. For more information, please visit the company's website at www.agios.com. This press release contains forward-looking statements, which are generally statements that are not historical facts. Forward-looking statements can be identified by the words ""expects," anticipates," "believes," "intends," "estimates," "plans," "will," "outlook" and similar expressions. Forward-looking statements are based on management's current plans, estimates, assumptions and projections, and speak only as of the date they are made. Neither Celgene nor Agios undertake any obligation to update any forward-looking statement in light of new information or future events, except as otherwise required by law. Forward-looking statements involve inherent risks and uncertainties, most of which are difficult to predict and are generally beyond each company's control. Actual results or outcomes may differ materially from those implied by the forward-looking statements as a result of the impact of a number of factors, many of which are discussed in more detail in the Annual Report on Form 10-K and other reports of each company filed with the Securities and Exchange Commission. Hyperlinks are provided as a convenience and for informational purposes only. Neither Celgene nor Agios bears any responsibility for the security or content of external websites. 1. IDHIFA Full Prescribing Information (U.S.). Celgene Corporation. Summit, NJ; July, 2017. 2. Ravandi F, et al. Characteristics and outcome of patients with acute myeloid leukemia refractory to 1 cycle of high-dose cytarabine-based induction chemotherapy. Blood. 2010;116 (26):5818-23. 3. Medeiros B, et al. Isocitrate dehydrogenase mutations in myeloid malignancies. Leukemia. 2017; 31:272-281. 4. National Cancer Institute Surveillance, Epidemiology, and End Results Program. 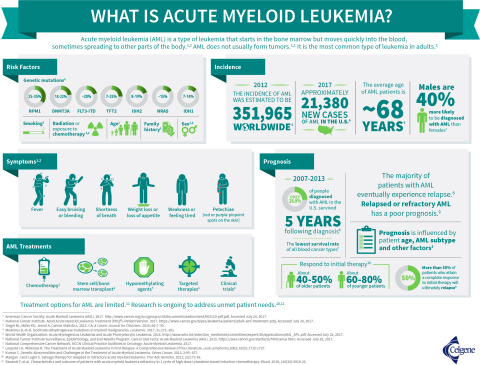 Cancer Stat Facts: Acute Myeloid Leukemia (AML). 2015. https://seer.cancer.gov/statfacts/html/amyl.html. Accessed July 28, 2017. 5. American Cancer Society. Acute Myeloid Leukemia (AML). 2017. http://www.cancer.org/acs/groups/cid/documents/webcontent/003110-pdf.pdf. Accessed July 19, 2017. 6. Kumar C. Genetic Abnormalities and Challenges in the Treatment of Acute Myeloid Leukemia. Genes Cancer. 2011; 2:95-107. Source: Celgene Corporation and Agios Pharmaceuticals, Inc.